„Destop Country ist ein digitales Musterland aus sauberen Reihenhaussiedlungen und mit vorbildlichen Bewohnern. A documentation of the numerous promises of absolute security encountered on user interfaces. I started to categorize the associated defensive imagery. The Defence Project is about the many promises of absolute security. Currently these symbols, icons illustrations and terms are spreading rapidly. Especially on current interfaces the defensive imagery leads to many striking examples that should not go unnoticed. With the Defence Project Plog I try to condense both projects and texts on this subject. With what was called a bird’s eye view in earlier times but nowadays immediately calls connotations to CCTV and surveillance, the makers of this ad knowingly open up a neatly composed Mise-en-scène. We are supposed to watch from far and not to participate. From above we see a concrete floor, a basketball field. Children are playing, they trundle hoops and throw balls. A celebration. We see a slide, a wheel of fortune. And a gigantic inflatable castle. 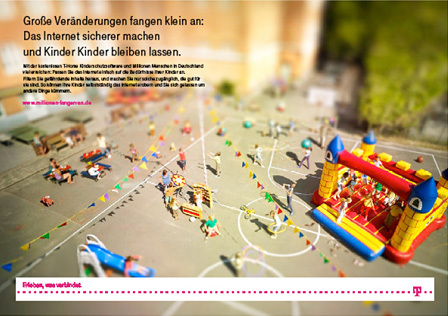 A text in the upper left corner reminds us that this perfect idyll was not achieved by the children’s parents, but by T-Home, the branch of Deutsche Telekom being responsible for landline communication. The parents, the ones this ad actually is made for, are surprisingly not present at all (or hidden behind a Gaussian blur making the ad’s text more readable). In this eeriness, the most important carrier of meaning is the colorful castle in the front. This certainly was sponsored by T-Home to the organizers of the street celebration. And they have their reasons: an inflatable castle is a great symbol for safety and lightness at the same time. A castle of stone does not imply the intended connotation. The positive meaning of security would change to a negative one, one of imprisonment. A bouncing castle does now. This blog deals with the strategies used to achieve a feeling of safety by visual means. 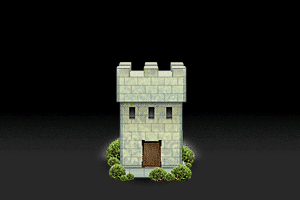 Especially on the internet and in the graphical user interface, depictions of (fire-) walls, small castles and cute vaults automatically add this lightness to the depiction of safety and both accompany each other in a mostly unintentionally comic interplay. This interplay is the topic of both Defence Project and its documentation.